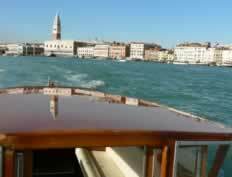 This tour offers a unique opportunity to enjoy all the best scenarios Venice presents, while sitting comfortably in a luxury waterborne taxi. We’ll start from the peaceful Lagoon surrounding Venice, one of the most peculiar natural environments of Europe, where the only sound is the chirp and twitter of the birds. We will then approach Venice and ride by the Old Shipyard and through some of its smaller and narrower canals of Castello district where you will appreciate the charming and silent atmosphere which makes Venice so romantic. Passing under some of its 400 bridges, you will admire the vibrant reverberation of the houses' façades on the water surface. The tour will eventually take you behind the Giudecca Island, to enjoy the Southern section of the Lagoon and eventually aproaching the Basin of St. Mark offering the most magnificent view of the Doge's Palace, the Bridge of Sighs and the Square. There will be prosecco wine, or other drinks, for all guests during the tour. 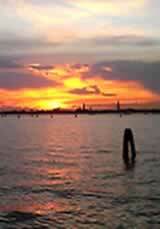 Our suggestion is to take the tour in the late afternoon, right before sunset when the light is ideal and provides the most relaxing atmosphere to approach the City of Venice. Of course it can be arranged at any time of the day, upon request. The price includes: professional guide service and the hiring of a private waterborne taxi, and a glass of prosecco (or other drinks).